Rhythm clocks are just plain fun! Delightful to watch and hear. They bring a smile to the faces of kids of all ages. Check it out!
. You may have seen it other places but never at our price. E-mail us! What is there not to Adore about this beauty? Simplicity has never looked so good. 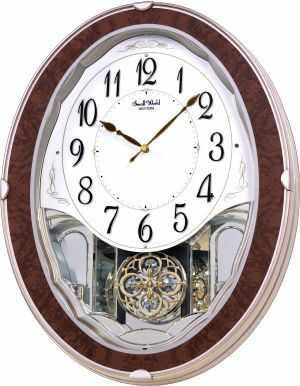 The bezel of the clock reveals a dark mahogany wood grain design. The clock plays one of 30 melodies on the hour. The center piece of this model is the artistic looking pendulum. This is definitely a great addition to a home. Clock is battery quartz operated. Plays one of 30 melodies every hour on the hour from 3 different melody selections.